CONWAY — Starting Point Services for the Victims of Domestic and Sexual Violence will hold its seventh annual Boots ‘n Bling Live and Silent Auction at the White Mountain Hotel on Saturday, May 20. Back by popular demand will be the Jonathan Sarty Band. Auctioneer Lucas Hunt will be on hand for the live auction. Raetha Stoddard, who became Starting Point’s executive director in July, noted that in a time of uncertainty in terms of federal and state funding, Boots ‘n Bling is key to providing victims in Carroll County with the necessary protection and support. The agency assists over 600 individuals each year. Starting Point provides court and child advocacy, a 24/7 hotline, crisis intervention and transitional housing. It hopes to raise $60,000 at this year’s event. Board Chair Greg Frizzell said the organization looked to feedback from past supporters who expressed a preference to having The White Mountain Hotel host the event. Past attendees indicated they hoped the agency would do away with mobile bidding and that the traditional bid sheets were preferred. “Our supporters are key to the success of the event so we always want to listen to their feedback,” said Frizzell. “We’re also pleased that sponsors we have approached are all coming back,” he said. 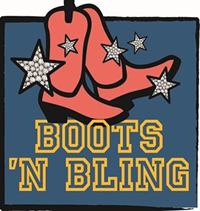 Memorial Hospital, Profile Subaru, Valley Originals and The Conway Daily Sun are among those participating in this year’s Boots ‘n Bling. Tickets are available on the agency’s website at www.startingpointnh.org, or by calling (603) 447-2494. Those wanting to reserve a table for eight are encouraged to do so early.